The Women’s Volleyball team played host to Indiana Wesleyan University on Saturday afternoon in hopes of breaking a three-match losing skid. Their effort came up short as the Wildcats defeated the Leafs in three sets. Goshen got out to their first and only lead of the day at 2-1 in the first set, following a kill from senior Hallie Vanitvelt. The rest of the set consisted of the Leafs trying to play catch-up. Sophomore Tessa Clark assisted her classmate Jennifer Ritchie for the kill to cut into the Wildcat lead at 14-15. However, impressive front row play by the Wildcats held off the Leafs as they captured the first set 21-25. The second set was more of the same for the away team as they jumped out to a 17-4 lead following three consecutive kills. Unforced errors plagued Goshen in the second set as they tallied three service errors, eight attacking errors, and two setting errors. The Wildcats capitalized on these mistakes and as a result, took the second set by a score of 10-25. In the third set, the Maple Leafs continued to battle as freshman Naomi Willis found sophomore Elizabeth Breckbill for the kill to cut the Wildcat lead to 12-15. However, Indiana Wesleyan’s outside hitter Kelly Miller was too much to handle, as she went for eight of her match-high 13 kills in the final set to surge the Wildcats to a 16-25 closing set victory. The Leafs drop to an overall record of 7-10 and 1-4 in the conference. Breckbill led the Maple Leaf attack with six kills, followed by Ritchie with five. 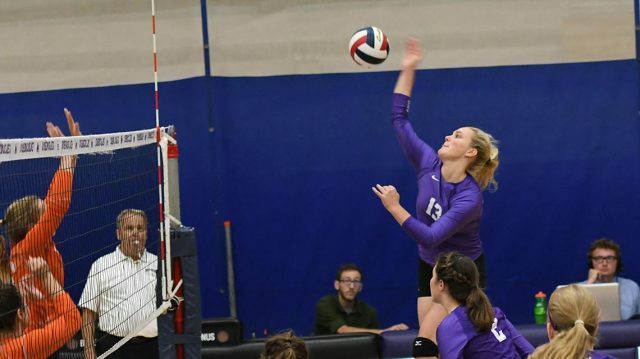 Sophomore Shelbey Younts’ 14 assists led the team, as Willis added eight. The defensive effort was paced by Willis’ eight digs, as Ritchie and seniors MacKinnon Tracy and Meghan Manley added six. The Maple Leafs next match will be a home contest against conference foe Grace College on Wednesday, September 19 beginning at 7 p.m.